Seed starting and our first tunnel. It’s hard to believe all the snow we had this winter is gone! Even harder to believe is how quickly it melted. We really couldn’t have had better weather for melting the snow and helping our spring along. We’ve been busy in the past month getting prepped for seed starting and starting seeds! In the next few days we’ll even plant our first transplants outside! It’s an exciting time of year filled with hope of another bountiful season. In this post we’ll go through our seed starting setup and talk a little about how the setup of our first caterpillar tunnel went. Our indoor seed starting setup has several important components. First, we have our basement prep table. This is where we fill our trays with organic potting mix. Trays have individual cells for each plant and come in a variety of sizes. We use two sizes that accommodate 50 and 128 plants. Once we’ve filled the trays with soil we plant each seed individually. We’ve already planted over 2000 seeds this year with many more to come! The next component is our germination chamber. This is a new addition to our farm that we made this spring out of a recycled upright freezer, a couple crockpots and a temperature and humidity controller. We’re really excited about this because it will allow us to control the two most important factors in seed germination: temperature and humidity. We’ve already seen great improvements in our germination rates especially with parsley. In the past, we’ve been lucky to be above 50% germination. That is, of the total number of seeds we planted we were lucky to have more than 50% of them germinate. This year, with the germination chamber, we’re over 90% germination on parsley! Side note: our other crops germinate much more consistently with rates approaching 100%. Finally, we have our grow racks. We bought one on Craigslist and the other we put together using parts we purchased from Home Depot. Simply put, it’s a series of shelves with lights on timers that simulate day and night cycles for our plants. Once our plants are established in their trays we’ll begin the process of “hardening off.” This process acclimates our little plants to the more harsh conditions they’ll face outside. The hardening off period allows the plants to adapt to full sunlight, wind, and greater temperature fluctuations before we plant them outside. This was our first go at setting up a caterpillar tunnel and overall it went pretty well. We started by measuring out where our tunnel will go so that we could set the corners. Then we pounded large rebar stakes into the ground every 5 feet on both sides. Next, we constructed the bows that support the structure from 3 pieces of curved metal tubing secured with tex screws. Then comes the plastic - we rolled out the plastic and pulled it up and over the bows. The plastic is secured on either end by metal t posts pounded into the ground. To tighten the plastic a series of crisscrossing ropes are installed and pulled tight in between each metal bow. Finally, we placed sand bags around the structure to secure the plastic to the ground in the event of wind. The whole family got in on the set up. Kit, our cat was very interested in the tools we were using and Axel, our dog just wanted to be near us! The finished tunnel. You can see why they call them caterpillar tunnels: the plastic pulled tight over the bows creates a segmented look, just like a caterpillar! Dan joining the bow sections together. Center purlin strap gives surprising rigidity to the structure. What'd we learn at MOSES 2019? Lara and I attended MOSES 2019 in La Crosse, WI this weekend. For those who are unfamiliar, MOSES (midwest organic and sustainable education service) is an organization that promotes organic and sustainable farming and hosts the largest organic farming conference in the United States. The conference is huge, with well over 3000 attendees, tons of presentations from farmers, scientists, PhD students and more as well as film screenings, research presentations and round table discussions. It’s sometimes hard to choose what to do at the conference because there are so many good options! We attended talks on subjects ranging from managing tomato diseases to pasture raised pork to stress management. In this blog post we’ll go through some of our big takeaways. I attended several talks on soil - it’s the foundation of everything we do - so I like to prioritize learning more about soil as much as I can. One big take away is scientists have a very small understanding of how soil works. In one acre of soil there is the biomass equivalent of 8.4 cows in things like bacteria, fungi, worms and other living creatures. Of that biomass scientists have only documented and named about 20% of those creatures. What does this mean for the farm? For us, limited understanding makes it hard to trust anyone that says x is the thing to do for your soil. Instead, we will try to mimic nature as closely as possible; this is what most agronomists would suggest. This includes using mixtures of cover crops to simulate the diverse species of plants you see in nature. Applying animal manures and compost to mimic the natural way animals fertilize soil and we will try to minimize tillage as much as possible. Lara also attended an introduction to soils class and found the current research continues to support the practices we are using. The big take away here is that we really need to invest more in caterpillar tunnels and high tunnels. We can reduce occurrences of tomato disease considerably which will increase our yields considerably. We’ve held off on investing in this infrastructure until we move to the land where the majority of our veggies are located. We’re making progress on this! We purchased a small caterpillar tunnel this season for use at our home (though we’re using it for lettuce production instead of tomato production). Other things we can do for our field tomatoes include things we’ve already been doing - crop rotations, pruning, laying mulch down, and applying organic copper at regular intervals to slow the spread of disease on a regular schedule. I (Lara) have always had a great interest in livestock. Convincing Dan to raise chickens has proven to be a great way to diversify our CSA and get free nitrogen rich manure! There are some great benefits to be gained were we to raise pigs. First, we would be able to sell high quality meat to our customers adding economic benefit to our farm and diversifying the CSA. Second, we would get free pig manure to enrich our soil. We would also get some low grade free tillage on our land as the pigs have a tendency to literally "root” around! They love eating plant roots high in sugar and will turn up soil in the process. Dan and I are interested in farming on a closed loop system which means anything that comes from the farm goes back into the farm - we wouldn’t have to pay so much to purchase outside fertilizers. In addition we want to farm in a way that mimics the natural symbiotic relationship of plants and animals. There is also the bonus of pig companionship! They are smart creatures with funny personalities. We are excited to invest in pigs in the next couple years! Lara attended a short session on women managing stress in agriculture. The tips provided in the session are applicable to all humans working in agriculture. Farming has one of the highest rates of suicide in the nation; many factors contribute: low wages, debt, isolation, intense labor. One way to manage the stress of the job is to plan vacations where you can focus on slowing down and resting your body and mind. Dan and I always take a one week vacation mid-season. It keeps us healthy! Other suggestions included making time for your hobbies, eating healthy, and taking care of your body (your greatest tool in farm work). The key message is farming will be stressful and having a plan to mitigate the stress will ensure a successful long term business. Better produce, more options for your CSA, healthy farmers, and healthy land! The things we learn at the conference are things that directly affect you. We apply the techniques and recommendations we learn to get better at producing healthy, great tasting produce and animals that will nourish you and your family. There are always things that we can do better and we always try to learn the best techniques to ensure everything we grow for you and your family is healthy, delicious and sustainable! More planting, more weeding and lots of progress! Spring planting continues on the farm. We planted our vine crops (cucumbers, summer squash, melons, etc) over memorial day weekend and were able to get in around 550 peppers, tomatoes and basil before the storms hit! We don't normally like to plant in that kind of heat but our plants were in need of being moved out of their pots and into the soil. Many of our crops do just fine in the heat - in particular sweet corn and popcorn LOVE the heat. Some of our crops suffer in the heat - lettuce, spinach, peas - all would have liked the 100 degree days to wait another month. Fortunately, it seems the damage was minimal and the rains really helped keep things going after that heat wave. We continue to work on weeds as they tend to love the heat as well. We will be writing a post soon that covers the many methods we use to control weeds on our farm. Stay tuned! In the meantime enjoy these photos of the progress on our farm. These peppers transplanted really well. Tomatoes are off to a decent start. Garlic - it has really good color to the leaves. Our arugula is under a bit of bug and weed pressure but the flavor is really good! We haven’t had this good of a start on our green beans ever! Chicken tractors, planting, and weeding! It's been a very busy month on the farm! The weather has finally warmed up, we're getting a good amount of rain (if not a little too much) and our new batch of layers have moved out of their brooder box to the outdoors. The first couple photos in the gallery below are pictures of our home-built "chicken tractor." A chicken tractor is a mobile enclosure that we will use for our meat chickens permanent home when they are big enough to move outdoors. Chicken tractors allow us to keep our meat chickens in a controlled location but also allow them to forage and be outdoors. We will move the tractor daily so that our chickens always have access to fresh pasture. The enclosure also keeps would-be predators out. It's a win-win situation. We've put our second batch of layers in our chicken tractor until they are big enough to integrate with our adult layers. This allows our adult chickens to "introduce" themselves to our new chickens without the risk of the new chickens being injured as they re-establish the pecking order. Yes, the pecking order is real thing; it's a social hierarchy of chickens that's established, sometimes by pecking, and each chicken has their own spot. 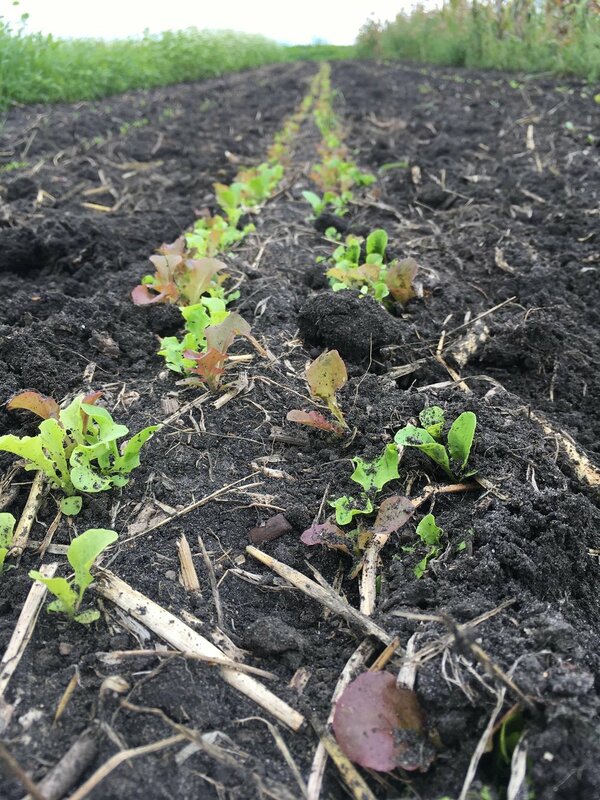 We were finally able to begin planting in early May - we started with our potatoes and onions and moved onto other early season crops like peas, lettuce and radish. As of this writing, we have planted potatoes, onions, peas, radish, lettuce, carrots, arugula, spinach, swiss chard, popcorn, kale, kohlrabi, brussels sprouts, and beets. We've also transplanted our cabbage, broccoli, thyme, oregano, and parsley from their indoor pots to their outdoor locations. It's been a busy couple of weeks! The warm weather and rain has helped all of our plants germinate quickly (and, unfortunately, the weeds too) and everything we've planted is up. We've begun cultivating our produce to try to get a head start on the weeds. We're also planning on transplanting our tomatoes, peppers, and basil in the coming week. Hey Folks! It feels a little strange to call this post a "spring" update since we haven't seen many days that resemble spring and there's still a decent amount of snow on the ground. Fortunately, the forecasts for the next few weeks seem very promising with temperatures reported to reach into the 60s by next week. We are very excited for the warmer temps and to get back out into field to begin planting our crops! You might be wondering if all this snow has an affect on our spring. Simply put, yes it does. By this time last year we had already planted potatoes, kale, kohlrabi, carrots, lettuce, onions, peas, and cilantro. This will likely push the first CSA pickup to mid June but it shouldn't affect the overall number of pickups. We will be closely monitoring our fields to make sure that as soon as it's ready to plant that we're planting! Despite us not being able to be in our field planting we have been busy starting plants indoors. We start several types of produce indoors including tomatoes, cabbage, broccoli, herbs, and peppers to give them a head start. This year, we have over 1400 plants started indoors and we're very pleased with how they are looking so far! We also recently received a new flock of chickens that will begin laying eggs for us in the fall. They are very cute, very fluffy, and really active little chicks. Between our baby chicks and our indoor plant starts we stay pretty busy! Baby peppers - you can see the first "true" leaves coming where the two cotyledons meet at the stem. Our thyme looks SO nice this year! So nice we had to take another picture of it. Did you know they ship baby chickens in boxes in the mail? Somehow we received 5 extra mystery chickens - the yellow chicks were not part of our order but were added anyway! We can wait to figure out what breed they are. What's special about our eggs? So what's so special about our eggs? This question is best answered in two parts: first, by the eggs nutritional differences and second by the differences in our chickens living conditions. To begin, lets talk about chicken egg nutrition. Long story short - our eggs are more nutritious than your typical supermarket eggs in a couple of different ways. First, because our chickens are pastured, they have access to various kinds of bugs and plants that chickens eat naturally. These bugs and plants contain nutrients, among others omega-3 fatty acids and riboflavin, that are generally not stable in the feed mixes that are fed to chickens that are confined to large barns. Omega-3 fatty acids and riboflavin will break down in feed before the chicken can eat and absorb it but in live bugs and plants it is available and accessible to the chicken and thus is present in the eggs that we eat. It should be noted that the contents of macro-nutrients such as protein are roughly equivalent between our pastured eggs and supermarket eggs. Our chickens also have a higher quality of life than the chickens that produce supermarket eggs. First, our chickens have unrestricted access to the outdoors. They are able to go outside to forage, socialize and enjoy the weather. They are never confined to cages. They are provided with clean straw in their coop to use as bedding which helps keep them clean and warm. We clean their coop regularly so that they may live in comfort and cleanliness. We think they have a pretty excellent life and they certainly seem like happy birds. Lara and I are passionate about ethical farming. We want our chickens to live in comfort and be happy (to the extent a chicken can be happy). We believe that if we take excellent care of our chickens they will take excellent care of us and produce tons of nutritious, wholesome eggs that can nourish our family and yours. Stating that egg marketing jargon is overwhelming is an understatement. With all the terms out there - cage free, organic, free range, pastured, natural just to name a few - it's difficult to know exactly what you're buying and supporting. To add further to the confusion these terms are not mutually exclusive. You could have an organic egg from a chicken that never sees the light of day for example. In this blog post, we'll go over what these terms mean and try to clear up the confusion on egg marketing jargon. Cage free is a pretty easy one. It means the chicken is not confined to a small cage, usually just barely bigger than the chicken itself, during its life. Unfortunately, this DOES NOT mean the chicken has access to the outdoors, or that the chicken is not packed into a poultry barn with thousands, or tens of thousands other chickens. Cage free is a start, but it's still a pretty atrocious life for a chicken. Organic is a term that is "owned" by the United States Department of Agriculture (USDA) that is given to agricultural products that meet a certain set of criteria. For egg laying chickens it means they're fed organic certified feeds, their bedding is organic certified, and they have some access to the outdoors. This is a lot better than cage free and gets really close to the standard of animal well-being we strive for. The catch is that the outdoor access can be very limited - maybe only an hour a day. Furthermore, a "screen porch" is an acceptable form of outdoor access meaning a poultry barn could pass its organic certification and a chicken could still never set foot on real ground. Free range is similar to the organic standard outlined above. It means the chicken has access to roam outside but that outside access could be limited and could just be a concrete slab which doesn't allow the chicken to forage. Natural is probably the most ambiguous of all the terms we'll outline in this post. When the term 'natural' is invoked most people probably think of a chicken running around a pasture foraging for insects, seeds and plants living a happy, carefree chicken life. What it really means it that the final product, eggs or meat, hasn't been altered. For example, brining or marinating a chicken after slaughter would disqualify a product from being natural. Pastured chicken is the gold standard for eggs and meat. It means the chickens are allowed unfettered, unrestricted access to a pasture where they can forage for insects, seeds, and plants. It allows the chicken to express it's full chickeness (a term coined by Joel Salatin of Polyface farms - an expert in sustainable farming). Pastured chicken usually get supplemental feed that helps round out their diet and provides when nature can't (like a Minnesota winter). Utilizing the list of terms above our chickens are: natural, cage free, free range, and pastured. Our chickens are not certified organic - the straw we use for their bedding comes from a neighbor farmer who is not organic certified and the feed we supplement their diet with is not certified organic. As beginning farmers we do not have the cash flow to pay for expensive organic feed. Additionally we value supporting local farmers and prefer to purchase straw from them. This is the best way, for us, to raise a flock of chickens for eggs. Our chickens have unrestricted access to the outdoors, they are able to roam and forage for insects and plants and we don't inject them with antibiotics or growth hormones. They have ample room in their chicken coop when the weather gets nasty and their straw is changed frequently to make sure they stay clean. We think they live pretty good lives and they certainly enhance ours! Much has happened since we last posted! We are happy to report we are still attending the Mankato Farmer's Market until the very last day; this Saturday October 28th Dan and I will have spinach, head lettuce, kohlrabi, radishes, kale, cilantro, and other fall squash and potatoes. We made the decision to harvest early this week due to forecasted snow! As of last Friday we were able to plant our garlic. We began this endeavor last fall with our first planting at home. Sales this summer were great and we continue to have folks stop by our stand to ask if we still have garlic. We sold out rather quickly and have planted about twice as much garlic for next season in hopes of keeping up with demand. We plant two hard neck varieties. Georgian Crystal and Chesnok Red are hardy cold weather varieties with strong garlic flavor. Our fields also require attention in the fall. We consider the health of our soil an integral aspect of sustainable farming. If you were to visit you would see our winter cover crop blankets most of the field. There are some barren spots where fall crops were planted and only recently tilled down. We are excited to say we have found a local farmer to spread cow manure to enrich our soil. We will use far less manufactured fertilizer come spring! Greetings! August has come and gone and we are in full produce production season! This is an exciting and busy time on the farm. In this post you will hear about our current produce as well as some new plantings we have done in preparation for the fall season. Below is a photo I took last week while out gathering produce. In the far rows you can see where our cover crop Buckwheat has matured. This will soon be tilled down as we plant our fall cover crops, tillage radish, Sudan grass, and clover. We were able to make space for this as we finished harvesting lettuce, carrots, radishes, broccoli, potatoes, and onions. It may sound like there are many vegetables you can’t get anymore, but that’s just not true. Tomatoes, bell peppers, zucchini, cucumber, squash, beets, carrots, and kale are all producing well! Melons should ripen in the next week or so! They have been delayed due to this unusual August with cooler than normal temperatures. Overall it’s also been just too wet. As with any season we have had our challenges and joys. One joy this year has been hiring help with our CSA. Lindsey has been working with us Mondays and half day Fridays to pick and prepare produce. She had limited experiencing working for a produce farm and was often delighted with the produce as she watched it grow! We are so grateful for her help. In the photo below Lindsey and I were able to enjoy time at Chankaska Creek Winery with our other job; Lindsey works at Number 4 & I work at 3rd Street Tavern. We won our dessert sales contest and so got to enjoy a lovely afternoon sipping wine. Lindsey will be greatly missed next season as she graduates from MSU in December and pursues her career as a dietitian. Looking forward we have planted crops for fall that have a short enough germination period to mature before the first frost (fingers crossed). This past Monday Dan planted spinach, lettuce mix, and radishes. These plants find summer temperatures to be too hot - with September approaching cooler weather will allow these plants to flourish. It's been a busy but exciting week here at Cedar Crate Farm - we had our first Farmers Market of the season and we delivered out first week of produce for our Subscription Produce CSA members. On top of that we've been spending a lot of time working on keeping the weeds down. We've made good progress but you'll notice in this weeks pictures that there are a bunch of weeds still out there. Enjoy this weeks photos folks! Swiss chard. You can see deer tracks and where they ate the chard. This is kohlrabi - you can make out the head in this picture. It's around the size of a ping pong ball. Closeup of the beets. Notice the distinctive red veining. It's been wet, rainy and cold the past few weeks but in the past few days things have really turned around. We've been busy getting caught up on planting and transplanting the past few days and we couldn't have asked for a better day this past Saturday. A cool breeze, warm but comfortable temperatures and no bugs! We worked hard and transplanted 250 pepper and tomato plants, weeded, and planted squash, watermelon, honeydew melon, cantaloupe and cucumbers. We're trying out some new things with our tomatoes this year. Tomatoes generally require some kind of support system since their fruits tend to weigh too much for the plant to support. We could just leave them on the ground but that's a vector for disease to infect our plants so we add support. This year we have several types of support. The first, tomato cages, are probably the most common but it's basically a wire cage that surrounds the tomato plant offering support. Second, we have stakes which tie the tomatoes to as they grow. Third, we have cattle panel fencing which is low gauge wire supported by posts that act as a trellis. Finally, we have a wire trellis system where we string a wire along steel posts and drop down a string attached to the wire for each plant to grow on. We will keep you updated on how each of these methods work. We are on track for a June 12 or June 19 start date for our Subscription Produce CSA offering. We will keep you updated on how things progress. Beautiful day on the farm! Close up of a tomato in it's cage. The cage provides support for the tomato as it grows. These potatoes have really grown in the past week! On the right are our rows of onions - they look absolutely beautiful! To the left are sugar snap peas. Snap peas on the right. Kohlrabi on the left. Green bean busting through the topsoil. I'm always amazed at how strong plants are. The first seeds are up! This time of year always gets me excited more than any other when the seeds we planted have germinated and have begun breaking through the soil. I think it's because of all of the potential that's inherent to a seed. Some seeds are as small as a grain of sand and seem equally inanimate yet are able to create a plant that sustains us. It's really quite incredible. When they finally poke through the ground it's an affirmation of their potential. With enough care, reasonable weather, and time they will produce abundant, beautiful food! Planting continued this past week and we have continued to work on our chicken coop. We've got the walls framed up, the frame is on skids, and the flooring is in. There's a lot left to be done including installing the sheathing, siding, roof, shingles and painting but we have made good progress. Our first baby chicks should arrive in early June! These onions have been up for a week or so. The rows are visible from the road. Hard to see but this is baby kale. Notice the purple-ish stem. Our garlic is about 16 inches tall already! It's currently forming bulbs underground. These are bell peppers. This is the last day they were inside before we begin the hardening off process where we gradually introduce them to the outdoors to get them used to full sunlight, wind, and rain. Tomatoes on their last day indoors. This is our hardening off station. It's in a shelter area of our property. Bonus: Axel eating a stick he found. Bonus #2: Chicken coop under construction. It will be 12ft by 8ft when complete and be big enough to house 40 chickens. We plan on having 20 to start with. April has been warm and wet. Not exactly ideal conditions but farmers rarely get ideal conditions. That said, we have still been able to plant most of what needs to be in the ground. The ground isn't as dry as we like so planting conditions aren't ideal. Damp ground means our tiller makes a lot of mud balls and our garden seeder doesn't work as well in mud balls. It works best in soil that's light and fluffy but that you don't sink down more than an inch when you step on it. Fun fact that you might not know: we don't plant everything all at once. On our farm we plant roughly every two weeks from early April through mid-June! Different types of produce fair differently in spring weather. Things like potatoes and peas can be planted as soon as the ground can be worked. Other things like melons and beans require warmer conditions - a late spring frost would kill these plants. Nice day for some farming! This is our tiller tractor with loader. The loader has been immensely useful around the farm. The machine attached to the back is our tiller which we use to prepare our soil for planting. Lara is working on re-potting tomatoes in this picture. Our transplants have grown too large for their pots so we move them to larger pots since it's too early to plant them outdoors. In this picture is our simple onion planing setup. The stake with the string we use to measure out our rows and helps to keep them straight. A nice straight row. The plants don't care if it's straight or now but certainly helps us humans keep organized. In this photo we're planting strawberries. They come as bare roots with crowns which is the growth point for strawberries. A few days later and we already have leaves! Close-up of the leaves! They look a little yellow which is normal since transplanting causes a lot of stress for plants. They will "green up" soon. This is our garden seeder without seed. If you look closely you can see holes in the seed plate which will receive seed, space them accordingly, and drop them into their row. This is a picture of our garden seeder's seed hopper with kohlrabi seed. The seeds sit themselves inside the holes seen in the previous picture and drop through a chute as we push the seeder across the ground.